That has got to be the best concert I've ever gone to. I may have left drenched in sweat (both my own and other people's). The mosh pit may have separated me from my friend, Lark. My ears may be ringing for days. But damn, it was so worth it. The latest version of Google Earth lets you explore the sky's constellations and galaxies, and it's a very awe-inspiring and humbling experience to say the least. Saw Paul Haggis' new movie tonight, and I'll be writing a review for the Daily Trojan soon enough. For now, all I want to say is that the film's final shot is one of such utter obviousness that all you can do is shake your head in disbelief. The long-delayed movie, "The Assassination of Jesse James by the Coward Robert Ford," just received an utterly gorgeous trailer (although its visual beauty should not come as a surprise, seeing that the D.P. here is none other than Roger Deakins). I was apprehensive about Todd Haynes' Bob Dylan movie, "I'm Not There," but this trailer has given me renewed hope. 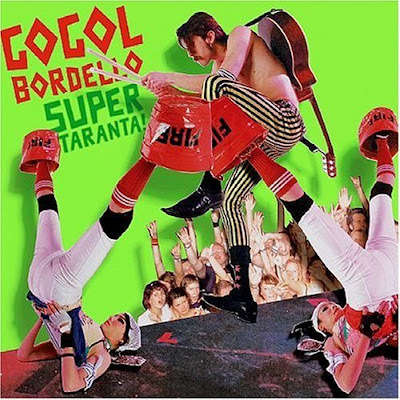 So, having given the album quite a few spins in my car's CD player, I've come to the conclusion that Gogol Bordello's "Super Taranta!" is the best album I've heard so far this year. Yes, even better than Arcade Fire's "Neon Bible." Gogol Bordello is definitely an acquired taste. You have to approach them with the same sort of enthusiasm they deliver. If you were, say, severely depressed, I'd imagine that listening to Gogol Bordello would make you want to slit your wrists, or at least make you wonder why these guys are having such a good time. But, I don't think you need to be ecstatically happy either. I'm sure being drunk or high wouldn't hurt, but speaking as a completely sober and mellow person, Gogol Bordello rules. I love Letterman's reaction... he had no idea what to make of them. Ticketmaster just allowed me to buy 2 tickets to the sold-out Gogol Bordello show @ The Music Box. A glitch, or divine providence? I met William Shatner and James Spader last night at a "Boston Legal" Q&A hosted by Arianna Huffington. Meeting Shatner is most likely somewhere on the list of the 7,439 things you must do before you die. My blurb on the event is here. We've entered an age where any amateur filmmaker can create convincing visual effects... at least convincing enough for YouTube. Either that, or we have visitors. Isn't she also a character on The Simpsons? 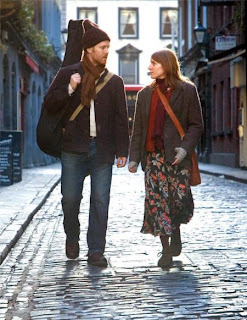 Last week, I talked to Glen Hansard and Marketa Irglova, the stars of the lovely Irish music pic, "Once." What struck me about them, besides Hansard's uncanny resemblance to my oldest brother, is that the two of them are such genuinely charming people. Their real personalities are very close to their cinematic counterparts, which isn't to say that they didn't gave solid performances. It's just rare to meet people who are, for lack of a better word, real. Compare Hansard and Irglova to the other people who attended the "Once" party at The Landmark Theatre. The PR people shuttled me around the wine bar (I should have had more wine, in retrospect), and I was introduced to so-and-so head of this, so-and-so head of that. These people, who have naturally never seen me before, were chipper and agreeable, and then they would say something like "It's so nice to see you again" or "I've enjoyed reading your work over the years." Yes... over the years... I'm sure my six-month stint at Variety has made THAT much of an impression. Still, I'll take all the compliments I can get, even if they do happen to be flat-out lies. My blurb about the "Once" event is here. 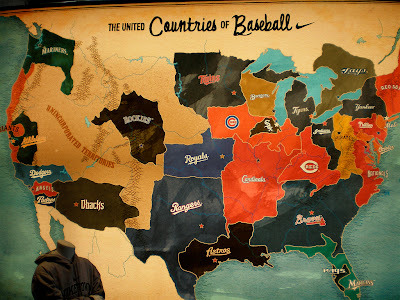 Fairly accurate, except there should be patches of Yankees territory spread all across the nation. Click on picture for a bigger image. They'll be playing in LA at the end of August... now I just need to find someone crazy enough to go along with me. Oh my God, how did I not know this band existed? An image that deserves to be in a Werner Herzog film. On Monday, the world lost two legendary directors, Michelangelo Antonioni and Ingmar Bergman. During the 60s, it was often considered that the big three European filmmakers were Antonioni, Bergman, and Federico Fellini. They were artists willing to do whatever was required to ensure their vision, and for Antonioni and Bergman, and it was a frequently bleak and atheist look at humanity. I've seen four Bergman films - "The Seventh Seal," "Fanny & Alexander," "Wild Strawberries," and "Persona." "The Seventh Seal" is a haunting and (occasionally) humorous look at how one approaches death; "Fanny & Alexander" is a flat-out masterpiece involving large families, the desolation of religion, the confusion of childhood, and candle farting; "Wild Strawberries," a meditative consideration of old age and lost opportunities; and "Persona," well, I still am not quite sure what to think of that movie. I've only seen one Antonioni - "L'Avventura" - which I am sad to say didn't really impress me. But it was easy to see that Antonioni had extraordinary talent, and I'm curious to try out "Blow-Up," "La Notte," "Eclipse," and "The Passenger." Both Bergman and Antonioni lived full lives (Bergman was 89, Antonioni 94). Many of the articles I've been reading have been suggesting that their deaths signal the ultimate end of an era - an era when directors challenged the status quo, challenged the Hollywood conventions, and made films of dazzling sophistication in terms of theme and formality. Nostalgia does strange things to people. Films are no better or no worse than before, but one thing is certain - Antonioni and Bergman were cinematic masters, and the world is somehow more empty without them around.